Cambridge: Cambridge University Press, 1897. First edition of the works of Archimedes. 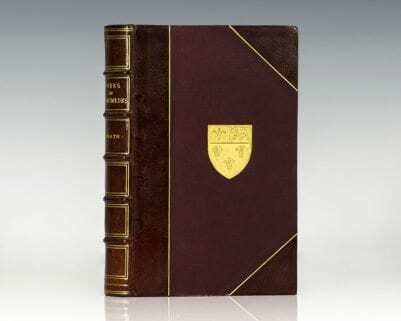 Octavo, bound in three quarters burgundy morocco, gilt titles and tooling to the spine, raised bands, gilt topstain, marbled endpapers, gilt insignia of the Eton College coat of arms on the front and rear panels. A bookplate indicating that the book is a gift to T. F. Halfords Fremantle from E. Lyttleton, Master of Eton College, dated 1914. Apparently a graduation prize. Fremantle was killed in the Great War in 1915, age 18. Edited in Modern Notation with Introductory Chapters by T. L. Heath.